This article seeks to advance the policy debate about court governance by reference to recent developments in Australia and other countries. It is argued that a corporate-style management board should be responsible for the judicial and administrative operations of the courts, with administrative judges and the CEO acting on the board as executive directors. It is contended that such an arrangement would be capable of achieving greater structural separation between “ownership” and “management” in the courts, which is regarded as an essential postulate of modern corporate law, because it promotes more expert and efficient management of large organisations. This article also seeks to resolve the inherent conceptual difficulties involved in applying the corporate law theory to the courts, by arguing that the so-called “stewardship” theory of corporate governance is capable of reconciling the key principles of modern corporate board design with the unique institutional character of the judicial organisation. Family reports are critical documents in family parenting cases. They are often the only social science information available to the judge, the lawyers and the parties. They are influential in judicial decision-making and out-of-court negotiations. Despite their importance there has been little direct research about the quality and impact of family reports in Australia. It is also known that family violence is a common occurrence in parenting cases that progress to litigation, and therefore the kinds of cases in which family reports are ordered, but again this is an under-researched issue. This article presents foundational information about the existing research to identify what is known about family reports and family violence. It examines the legislative framework for family report writing and analyses the official guidelines and documents and informal information that provide context to this work. It considers what family report writers need to know and understand about family violence to write reports that deal appropriately with family violence and make safe recommendations. Australian and international research on family violence, its impact on parenting, its role in family law proceedings and its influence in family report writing is reviewed. The article concludes that Australian research in this area is required to contribute to improved practices in family reports. Self-represented parties are a common phenomenon in modern litigation. They bring with them multiple challenges that impact on the quality of justice that they, as well as other parties, obtain. They have substantial impact on court management, and potentially on judicial impartiality. The provision of unbundled legal services, where the lawyer provides limited legal support for parts of the case, is one proposed solution to these impacts. The US, UK, and Canada have all introduced detailed procedures that enable lawyers to provide flexible legal services for self-represented litigants (SRLs). Recognising the considerable risks arising out of limited services, these procedures focus on client care, quality of service, and risk management. This article examines the challenge of SRLs, and the policy initiatives that have been addressed in other international jurisdictions. It then considers the developing case law on professional liability in Australia. It concludes that neither case law nor professional standards regimes stand in the way of formalising the provision of unbundled services in Australia, leading to long overdue reform. Textual analysis and eDiscovery processes are increasingly being used in the legal domain to consider large databases of information and to extract material that can be used to support hypotheses in individual disputes. In this article, an exploratory study reporting on how these types of processes can be used with big data justice sets (publicly reported cases in New South Wales and Victoria) suggests that the processes may have utility in the context of discovering more about why some disputes are more likely to be determined by a judge. Additional data sets and more conventional research approaches could assist to formulate referral indicia and although raw findings suggest some correlation between some factors that are present in litigated cases and suggests that textual analysis has considerable promise as one supportive research methodology. Justices of the Peace with limited training and minimal supervision continue to act as judicial officers in Western Australia. While this runs contrary to assumptions of professionalism and judicial independence (as well as recommendations to abolish the practice), many of these JPs have a broad discretion to deal with questions of bail and sentencing. Their use is particularly concerning in light of the extraordinarily high rates of Aboriginal incarceration in Western Australia. Local magistrates, who are severely under-resourced, understandably rely on JPs. The State government enables this regime to persist through the under-funding of the local courts, particularly in regional and remote Western Australia. Appropriate resourcing of the Magistrates Courts is required to ensure it has judicial officers who are acting as judicial decision-makers. 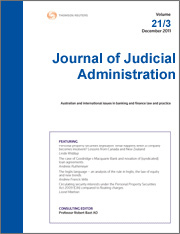 For the PDF version of the table of contents, click here: JJA Vol 25 No 4 Contents.